My earlier article described how I put together a new wooden planter for my courtyard garden, made by Woodblocx. I’ve now finished it. First, I gave the rough planed outside a sand down with a medium grade sanding disc, wiped it over and then applied two coats of Dulux Woodsheen (colour Ebony) to make the finished article match in with the other black planters in the garden. This gives it a nice semi gloss finish. I then fixed some hammer- in studs to the bottom to raise it slightly off the ground (to prevent it being in contact with standing water), and lined it with landscape fabric, stapled to the sides to give a neat finish. This will hold the soil in and also protect the inside surfaces of the planter. The planter painted and lined, ready to fill. I then made up a mix to fill it- roughly 3 parts soil, 2 parts compost and 2 parts horticultural grit, to ensure that the soil is free draining. Having really packed this in and slightly overfilled it to allow for settlement, I arranged a selection of alpine plants I’d bought from my local nursery (£12.50 for ten plants – I ended up buying 20 – and then a few more larger plants to give the planting a bit of structure). The planter isn’t really large enough for me to create a more ‘mountain-like’ scene with rocks and crevices to create shady conditions, but hopefully the plants that need a shadier spot will be helped by the shade cast by the larger plants. 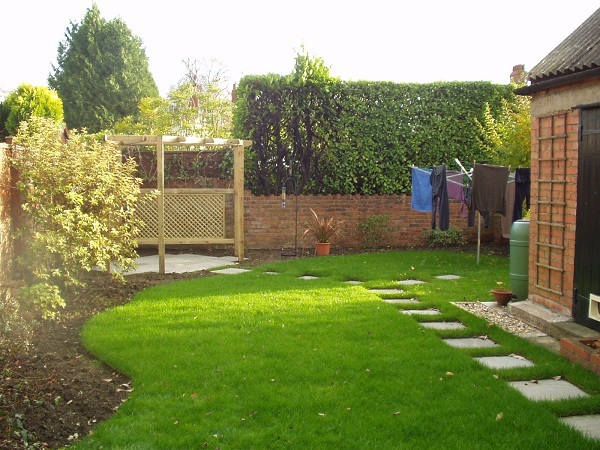 To finish off or ‘dress’ the surface I used a bag of ‘Eco Aggregate’ – this is a range of recycled stones. I chose crushed terracotta (old tiles) which picks up the colours of some of the other terracotta pots, brickwork and floor pavers. I’m pleased with the result – it will add an interesting feature to the courtyard and is low enough to be viewed from the seating next to it. What do you think? If you’re interested in finding out more about ‘Woodblocx’ click the link on the right hand side. Looking good. It will give lots of pleasure for a long time. Thanks, I hope so. How’s the lottie coming along? « Could this be the most play-literate PR video ever?